At Science in Sport they are dedicated to developing the best sports nutrition products to help endurance athletes perform at their best. 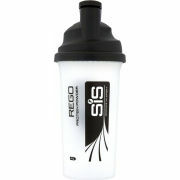 Their range includes award winning gels, powders, bars and supplements, used by elite athletes around the world. Protein and carbohydrate complex with high levels of rapidly absorbed, pre-digested hydrolysated proteins, whey protein isolates, peptide bonded glutamine, creatine and much more to accelerate your recovery from, and adaptation to, exercise. Recover - adapt - improve! To recover, rebuild and support the body's adaptation to training. When you are in a training programme and need your body to adapt to increasing demands. A full spectrum recovery product for periods of intense training. Developed with feedback from the Olympic cyclist Chris Boardman, it helps your muscles to recover and rebuild. Use immediately after exercise to help your body adapt to increased training demands to become stronger as quickly as possible. Easy on the stomach, so it can be taken after hard exercise. Available in Strawberry, Banana, Vanilla, and Chocolate flavours. Please note: Rego Total Recovery. My favourite recovery drink, tasty (chocolate) , with good price. Now I can't claim to have a lot of experience with different recovery drinks. But this one tastes good and I definitely notice the effects when consumed straight after exercise. Recommended. excellent product restoration with great taste without it being annoying sweet. cheapest place I found on-line. got the strawberry flavour. I'm sure it does something to improve my performance..... I've convinced myself of that although I'm not sure I can prove it. Purchased the strawberry flavour and the taste is very nice with part mix of milk and water. Used this product after every ride and I can feel my legs are less sore the morning after. Absolute must buy at this price. Will buy again. Despite my initial scepticism about recovery based products, this does appear to work; with what I would class as a marked difference in my post-ride recovery. The strawberry flavoured drink is sweet but by not sickly, and very easy to mix and drink. Whilst it's on offer, it's well worth trying. This is an excellent product that easy to mix and easy to drink. Since i started to use it my muscles recovery much quicker.